For the newspaper, see Banbury Cake (newspaper). 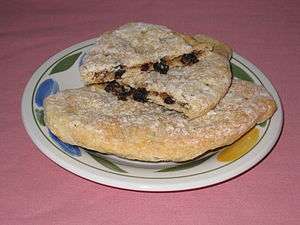 A Banbury cake is a spiced, currant-filled, flat pastry cake similar to an Eccles cake, although it is more oval in shape. Once made and sold exclusively in Banbury, England, Banbury cakes have been made in the region to secret recipes since 1586 and are still made there today, although not in such quantity. The cakes were once sent as far afield as Australia, India and America. Banbury cakes were first made by Edward Welchman, whose shop was on Parsons Street. Documented recipes were published by Gervase Markham (in The English Huswife, 1615, pages 75–76) and others during the 17th century. 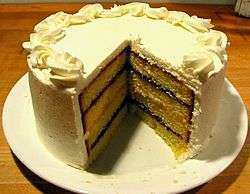 These recipes generally differ greatly from the modern idea of a Banbury cake, in terms of their size, the nature of the pastry, and how the cake is made. In the late 19th century, the notorious refreshment rooms at Swindon railway station sold "Banbury cakes and pork pies (obviously stale)". Besides currants, the filling typically includes mixed peel, brown sugar, rose water, rum, and nutmeg. Banbury cakes were traditionally enjoyed with afternoon tea. ↑ "A Timeline of the History of Banbury". Local Histories. Retrieved 12 February 2016. ↑ Little (2003), p. 27. ↑ MacDermot (1931), p. 409. ↑ Booker (1985), p. 107. Booker, Frank (1985) . The Great Western Railway: A New History (2nd ed.). David & Charles. ISBN 0-946537-16-X. Little, Brian (2003). Banbury: A History. Phillimore & Co. ISBN 1-86077-242-0. MacDermot, E. T. (1931). History of the Great Western Railway, vol. II: 1863-1921. Great Western Railway.